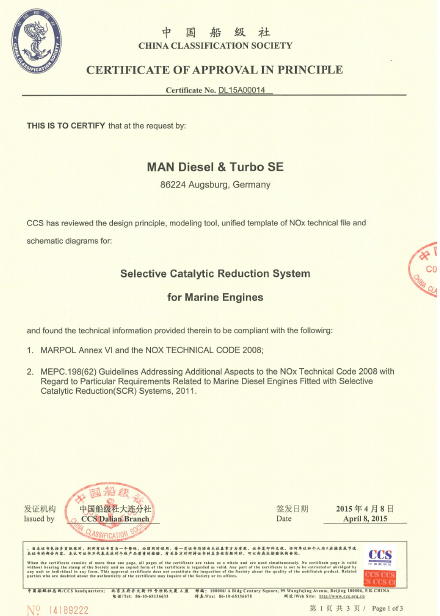 At an awards ceremony held on 15 April, 2015 at the PrimeServ Academy in Shanghai, MAN Diesel & Turbo SE was awarded approval in principle for its SCR system for the entire medium-speed engine portfolio fulfilling IMO Tier III regulations by the China Classification Society (CCS). Testing took place on an MAN 8L21/31 auxiliary engine with an integrated SCR system but the certificate applies to the entire medium-speed engine portfolio . The MAN-built engine is bound for a DFDS Seaways Ro-Ro vessel, the ‘Petunia Seaways’. The ceremony was attended by major ship owner companies and licensees. Goetz Kassing, Chairman and Head of MDT China, received the certificate on behalf of MAN Diesel & Turbo from Sun Feng, Vice President of CCS. “This certificate represents an important milestone in our collaboration with CCS and is of utmost importance in providing a complete IMO Tier III package solution to our customers,” said Dr. Daniel Struckmeier – Head of Emission 2016 – Senior Project Manager, MAN Diesel & Turbo. “This milestone is one of three agreed major steps in a long-term relationship with CCS. The first step has been accomplished after issuance of the first IMO Tier III EIAPP certificate for the 21/31 engine group in February this year. Today’s award finalised the second step, which includes the certification of the MAN Diesel & Turbo-SCR modelling tool, covering the MAN Diesel & Turbo engine portfolio from 5L16/24 to 18V48/60. From today on, every customer can profit from the easy and effective way of IMO TIER III certification for all MDT four-stroke engines. The final step, planned for autumn of this year, will incorporate the issuance of a general approval of our entire engine portfolio based on the afore-mentioned MAN Diesel & Turbo SCR modelling tool." 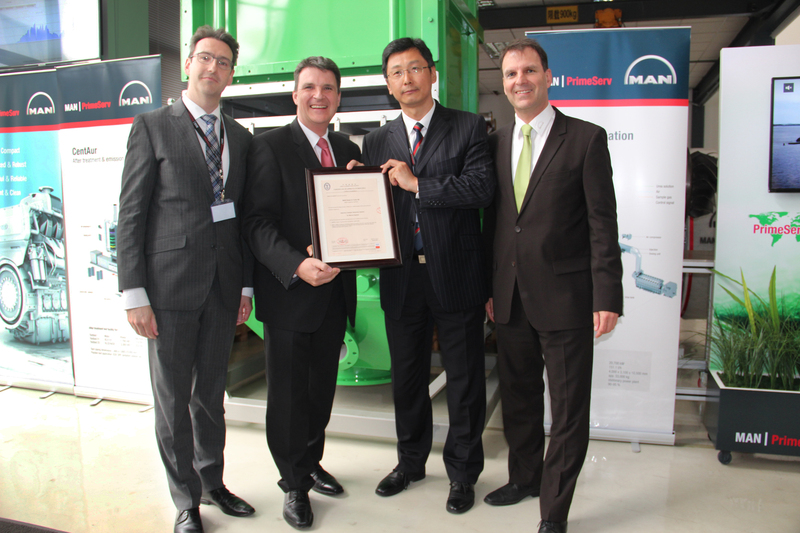 In December 2013, MAN Diesel & Turbo signed a Framework Agreement with CCS for Technical Cooperation during Marintec China. Both parties have since strengthened their cooperation in the fields of ship technology, ship-type research & development and market cooperation. “We are glad to present the first Tier III Certificate to MAN. Based on the good cooperation, we can provide a better service for the marine and shipbuilding industry,” said Sun Feng after the ceremony.